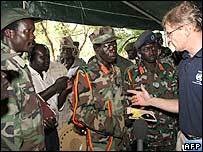 UN humanitarian chief Jan Egeland has held an unprecedented meeting with Ugandan rebel leader Joseph Kony. The meeting is part of moves to boost peace talks aimed at ending the Lord's Resistance Army's 20-year insurgency. The 10-minute meeting with Mr Kony - who is wanted for alleged war crimes during the conflict - took place at a remote camp on the south Sudan border. Mr Egeland had said it would only go ahead if rebels agreed to free abducted children, but this did not happen. He has described the war as the world's most neglected humanitarian crisis. Accompanied by senior Sudan officials, Mr Egeland went to a camp in the south early on Sunday where fighters belonging to the Lord's Resistance Army (LRA) are gathered. The BBC's Jonah Fisher, who was at the scene, says that after making the UN envoy wait for more than two hours, Joseph Kony strode out of the jungle. Flanked by Kalashnikov-toting fighters in t-shirts and wellington boots, the rebel leader walked into the camp and shook hands with Mr Egeland beneath a green UN tent. 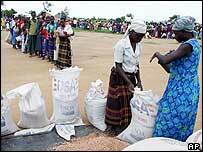 Mr Egeland said the LRA had agreed to give the UN an assessment of how many were in its camps. Speaking to reporters, Mr Kony denied kidnapping children or women and holding people against their will. "We don't have any children or wounded, only combatants," he said. The LRA leader also asked Mr Egeland to intervene to cancel an arrest warrant issued against him for war crimes by the International Criminal Court - a body over which he has no authority. "We are talking about the peace talks in Juba," Mr Kony told reporters, adding that he would go to the talks if the indictments were lifted. Mr Egeland said the meeting had been worthwhile. "I was able to bring up the situation for the civilian population in northern Uganda, the absolute necessity for them to continue respecting the cessation of hostilities," he said. Our correspondent says it is the first time that a senior international diplomat such as Mr Egeland has met the LRA and that it is a significant moment for the rebel group. In fact, Mr Kony is only known to have appeared twice before in the presence of journalists. Joseph Kony - a self-proclaimed mystic in his forties - has led the LRA through 20 years of brutal civil war in northern Uganda. His fighters are accused of abducting children in northern Uganda and southern Sudan and driving more than 1.5 million people from their homes. Tens of thousands of people have also died in the conflict. Sudan has been hosting talks between Uganda's government and rebel leaders in the southern town of Juba, but Mr Kony has refused to attend in case he is arrested. The Ugandan government says it will not consider an amnesty for the rebels until a peace deal is reached. However, the past few months have seen progress stall, with arguments over ceasefire violations and whether LRA fighters are really gathering at two designated assembly points.